Perennial 12 - 50 cm tall plant. Rhizome thin. Stem flattened, up to 30 cm high, shorter than leaves, with 1 - 3 flowers. Leaves narrowly linear, 1 - 5 mm wide, with clearly visible veins. Bracts extended lance with dorsal edge, grassy, hard. Flowers with stems, equal to length of the ovary. Perianth tube about 2 times longer than the ovary. Perianth leaflets light purple with dark veins, external basically narrowed in egg-shaped claw, separated from the elliptical expanded rounded part to suddenly expressed embarrassment. Internal leaflets of the perianth lance wedge, on top incised or rounded. Fruit hexagonal box with 3 wide and 3 narrow walls atop narrowed in small beak. Economic importance. It can be used for decorative purposes. Iris sintenisii is a species in the genus Iris, it is also in the subgenus of Limniris and in Series Spuriae, with violet-blue flowers. It is a rhizomatous perennial plant, from regions of Europe, Russia, and Turkey. It is cultivated as an ornamental plant in temperate regions. Iris sintenisii is intermediate in appearance and form between Iris graminea and a small Iris spuria. It has thin (or slender), wiry (or hard), short rhizomes. That are covered with the brown, fibrous remains of the last seasons leaves. Over time it forms many branches to create a tight clumps or tussocks. It has linear, glaucous green to dark green, rigid, acuminate (tapering to a long point), grass-like leaves. They are often described as evergreen. They have clear pronounced veins. They can grow up to between 10–50 cm (4–20 in) long, and 0.3–0.5 cm wide. The leaves often exceed the height of the flower stems. Iris sintenisii is smaller than Iris graminea. It has cylindrical or slightly compressed, unbranched stems. They can grow up to between 10–40 cm (4–16 in) long. The stems have 2-3, green spathes, (leaves of the flower bud), that are 3.5-7.5 cm long. The leaves are all keeled. The inner leaves are slightly longer the outer leaves. The stems or peduncle hold 1 or 2, terminal (top of stem) flowers, between late spring and summer, between June and July. 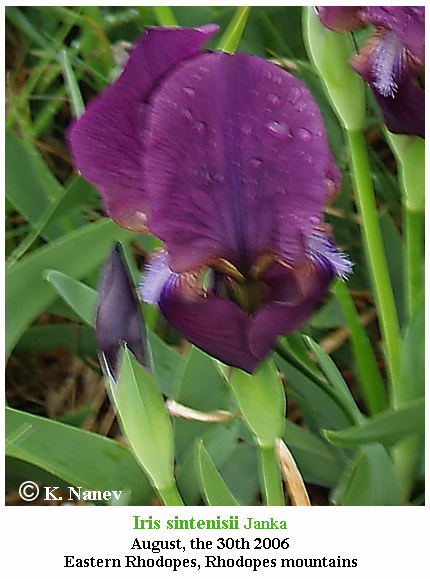 The flowers are similar in form to Iris graminea but in different shades of colour. The flowers are not scented, and can be up 5–6 cm (2–2 in) in diameter, and come in shades of violet-blue, blue-purple, blue, purple, and violet. It has 2 pairs of petals, 3 large sepals (outer petals), known as the 'falls' and 3 inner, smaller petals (or tepals, known as the 'standards'. The slender falls are slightly panduriform (shaped like a fiddle). They have a rounded or ovate/elliptic blade, measuring 1.3–1.4 cm long and 0.9–1.3 cm wide. Then they have a narrowing before a long oval haft (connecting to the stem), measuring 2.5–3 cm long and 0.3–0.5 cm wide. The haft is veined with red-purple. They are white or cream, heavily veined violet-blue or purple. It has single coloured (violet-blue to blue-purple), upright standards that are oblanceolate and 3–4 cm long and 0.4–0.5 cm wide. It has single coloured (violet-blue to blue-purple), style branches, that are 2.6–2.8 cm long and 0.5–0.6 cm wide, with recurved lobes. It has a small slender ovary 1–2 cm long, with a slender beak. It also has small, triangular crests. This iris is uniquely pollinated by ants, as the flowers secrete nectar at the base of the petals. After the iris has flowered, it produces an oblong, seed capsule, 1.5 cm long and 1 cm wide. It also has a slender beak appendage up to 2 cm long. It is known as Sintenis-Schwertlilie in Germany. 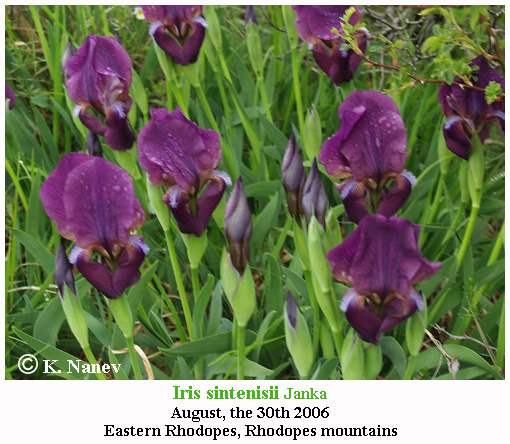 It has the common name of Sintenisa Iris. The Latin specific epithet sintenisii refers to Paul Sintenis, a botanical collector. Specimens were first collected by Sintenis from the Dobrudja district, on the western coast of the Black Sea, to the south of the mouth of the Danube. It was then published and described by Victor Janka von Bules in 'Természetrajzi Füz'. (from Budapest) Vol1 page244 in 1877. In 1994, it was given Award of Garden Merit(AGM). It was verified by United States Department of Agriculture Agricultural Research Service on 4 April 2003. Iris sintenisii is an accepted name by the RHS. 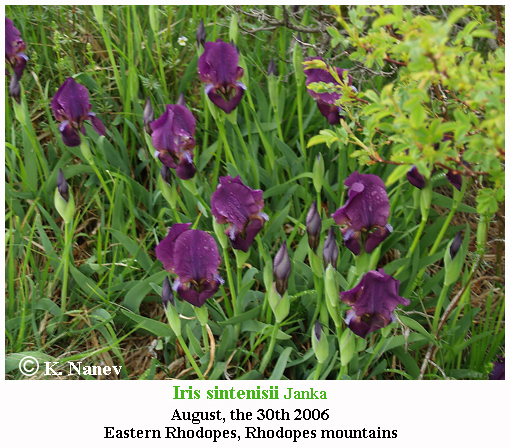 Iris sintenisii is native to temperate regions of Asia Minor, and eastern Europe and south eastern Europe. Iris sintenisii grows in dry grass meadows (including steppes), on scrubland, and at the edges of forests. It can be found at altitudes of between 900-1500m above sea level. It can though be difficult to spot within meadows, after flowering as the leaves are very grass-like. Distribution in Bulgaria: Grow around bushes and bright oak forests in the south and east of the country up to 1000 m altitude. (Conspectus of the Bulgarian Vascular Flora) = conspectus&gs_l= Zlc. Distribution: Balkan Peninsula (south and eastern part), Asia Minor.